LinkedIn is the world’s largest professional network focused on building a professional identity online and connecting opportunities, business deals and new ventures together. It’s essentially a virtual r?sum? where you can flaunt your talents, be endorsed for your skills by other professionals and find clients or employment through related channels. In order to see a member’s full profile, you must be connected to them (similar to being their friend on Facebook), but loosely associated acquaintances are able to see each other’s basic information that they’ve made public on their profile. If you have no connections to a user, you won’t be able to see any of their information that they haven’t set to be public for all. Although LinkedIn is primarily used for professional networking at this time, promoting your business is gaining in popularity. They also have groups (like the Small Business Owners Group) where professionals or businesses in similar fields can ask and answer questions about topics relevant to their area as well as groups for schools that help with pre- and post-graduate topics. It’s a great place to get more informed on best business practices, marketing tips and trends in your field as well as contribute your own thoughts and methodologies! While LinkedIn offers company pages, at this time the best implementation for a smaller-scale endeavor like a sole proprietorship is to create and flesh out an individual LinkedIn profile for yourself. So let’s get started! This process takes about thirty minutes and you will need: A business email address (at your domain or Gmail, Yahoo!, Hotmail, etc), a copy of your most recent r?sum? (or similar). If you don’t already have a r?sum?, this profile can help you to structure one, or you can see our guides on r?sum? building. 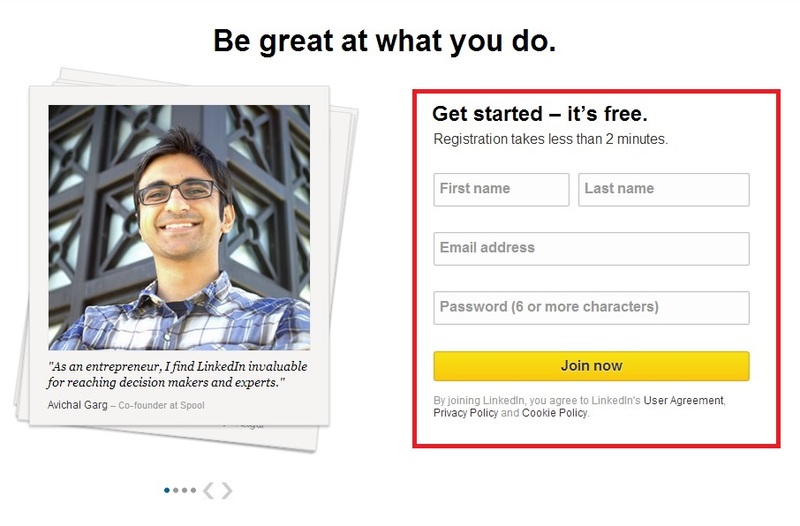 To begin setting up your LinkedIn profile, navigate to their home page at https://www.linkedin.com/ fill out their form and click on “Join Now” to get started. The next page will ask you for some additional information to help categorize your profile to be most effective. This form is dynamic and will ask you for the appropriate information depending on whether you selected that you are employed, seeking a job or are a student (i.e. the student form asks for the school you attended and when). If you select “Employed” and are self-employed, the form’s drop-down menu will switch from saying Company to saying Industry. Industry options that may fit for you would be Health, Wellness and Fitness, Consumer Services, or even Professional Training & Coaching. It will then ask you import your email contacts and if you select “skip this step” it will ask you to Confirm Your Google Account. You can confirm your account by either logging into it through their system (the blue button) or select “Send a confirmation email instead” which will email you a link to click on to activate your account. 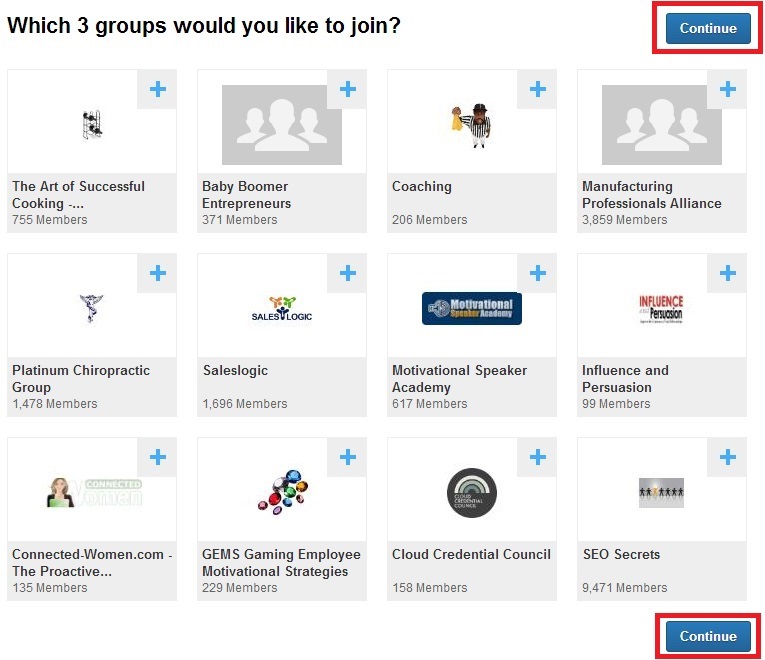 The next page will suggest groups for you to join–some of them may be spot on, or you may find that they aren’t quite what you’re looking for. If you see a group you’d like to join, hover over it and select join. Otherwise, click on continue. 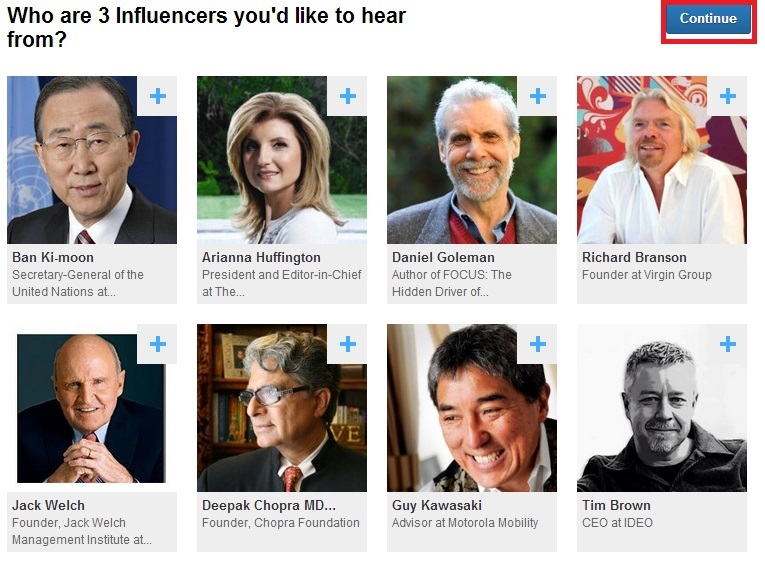 Step 3 invites you to select influencers to receive updates from. Just as with the groups you may see some you like or perhaps not, so follow any of the ones that are appealing and select continue. The final step presents you with some companies that might be of interest to you based on your industry or employer. When you’ve selected some companies or decided there aren’t any of interest to you, select “See your new Homepage” to complete the initial registration and see what those companies, groups and individuals you elected to follow have been posting lately. Once you’ve scanned through the updates and gotten a feel for the possible uses of this site, take a look across the top of the page at the LinkedIn menu bar. Home – Takes you to your homepage on LinkedIn and shows you what your connections are up to through updates. You can share updates here. Profile – Allows you to edit your profile and with a premium account see who’s viewed yours. On the far right, there is an envelope where you’ll be able to see your invitations to connect and messages from other people/businesses. The flag to the right holds all of your notifications like new endorsements, profile views and new connections. The head to the right of that takes you to an area to add connections through your email and the far right icon is for general account settings such as privacy, email notifications and logging out. 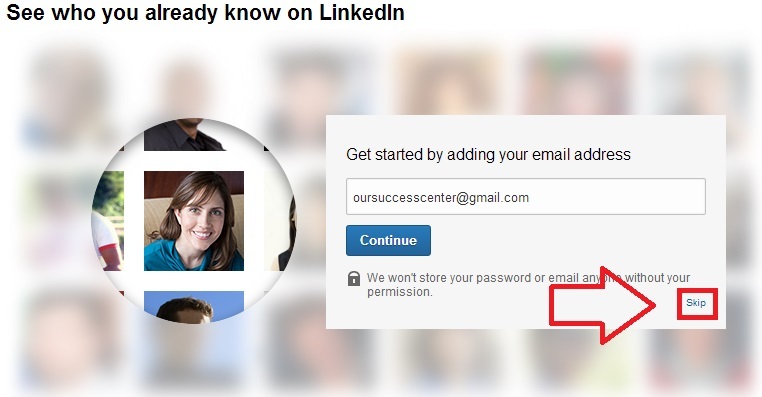 The easiest way to get your profile completed is to click on the profile button at the top and walk through the questions that LinkedIn will ask you about your education, past experience, skills and background. This is where having that r?sum? handy really becomes useful! Once you have your profile fleshed out and some connections added, go forth and over time you’ll see your network grow! For additional information not covered here, please check out LinkedIn?s help section.